The common cold seems to rear its ugly head every winter. The average American gets 2-3 colds per year, with an exponential increase in this number in children. Unfortunately, due to their viral origin, antibiotics do little to slow or eradicate these colds. More and more people are now turning to natural remedies as opposed to cough and cold medicines for quicker relief without the side effects of over-the-counter medications–many of which are now appearing to be more dangerous for younger children. As far as natural remedies go, raw honey remains one of the best options for supporting the body’s immune system. Studies have shown raw honey’s benefit in boosting the immune system and aiding the body in fighting off diseases such as the common cold faster. Raw honey contains natural vitamins, enzymes, minerals, and antioxidants which help to ward off allergies as well as providing anti-viral and anti-fungal benefits. These inherent properties also help to boost immune function and digestive health and heal skin conditions. Just as important is knowing where your honey comes from. Many honey available on shelves at large chain grocery stores, drugstores, and mass/big box outlets have been shown to lack the nutritional and medicinal value raw honey inherently has. This is due to overheating of the honey and filtering the pollen to make the honey retain its liquefied form. (See one of our previous blogs here to read more on commercial honey compared to real raw honey). 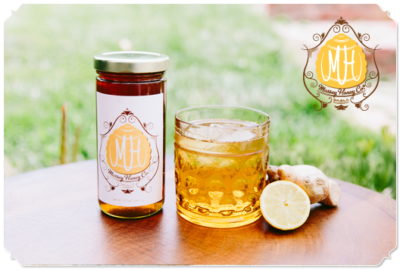 In addition to honey, other natural remedies include ginger root, garlic, cayenne pepper, lemon, and Echinacea. These, along with honey can be mixed into your tea or made into a drink to boost the immune system. The next time you are feeling under the weather, or just want to give your immune system a boost, mix in some raw honey or take a spoonful to give your body one of nature’s best remedies.